Join us at FrameHouse & Jask for a Happy Hour event on Thursday, December 20th from 5:30-8pm. Off the Wall features the work of 38 artist members. 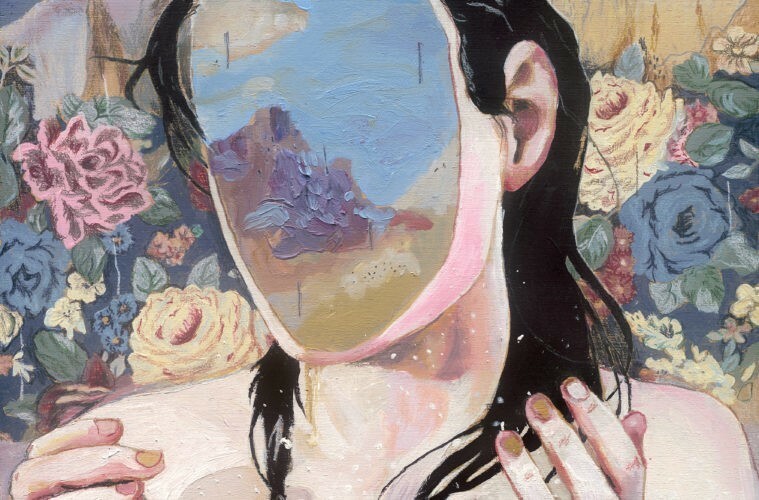 All artwork is priced at $500 and under, with the majority of the work priced under $300. 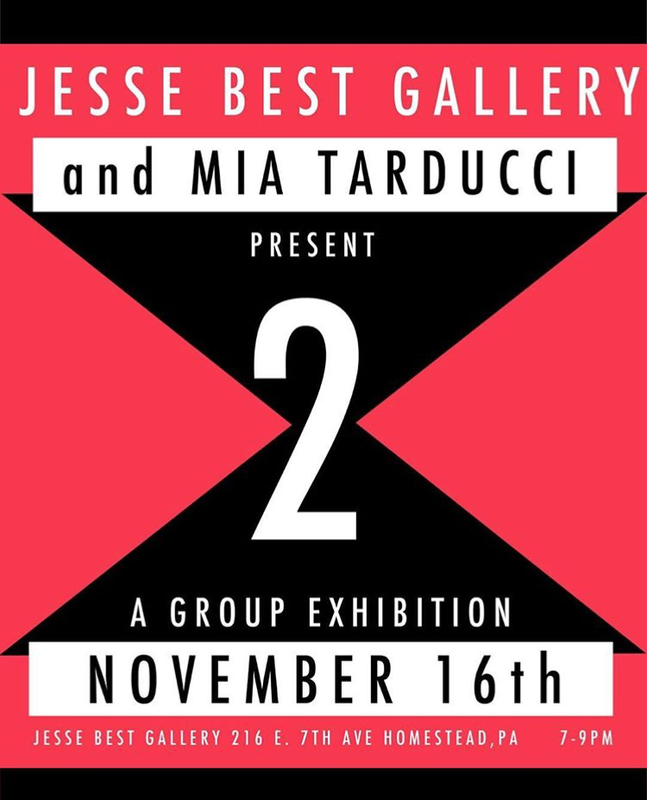 Don’t miss the incredible talent included in this group show curated by Jesse Best and Mia Tarducci! “2” opens this Friday (11.16) at the Jesse Best Gallery in Homestead, PA. 7-9 PM! Curated by Erika Diamond, this exhibition draws together contemporary artists whose works depict the structural intricacy and metaphorical connectivity of Lace. Exploring diverse themes such as heritage or geology, each artist uses intertwined patterns that uniquely reveal our attachments to place and each other. From textiles to flame worked glass, they examine the fragility and resilience of our entanglements as well as their chosen medium. Open Studio at Radiant Hall Nova Place! Take a free behind the scenes look at how and where Pittsburgh artists create! As part of Nova Nights Party on the Plaza, Radiant Hall Studios will open it's doors to the public. 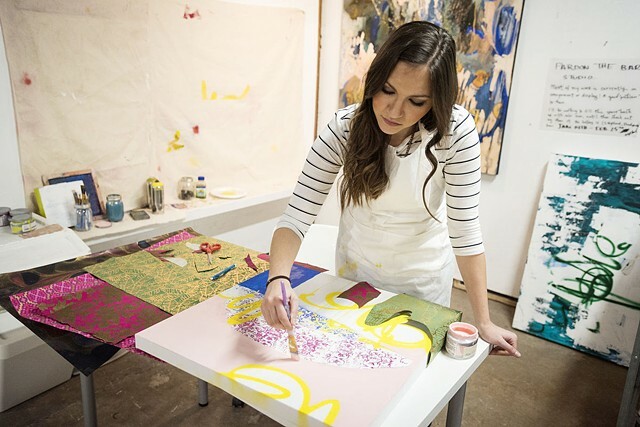 Ask questions, see the artists' processes, and tour their studios. Radiant Hall artists work in a variety of medias; there's something for everyone. Food Trucks & Live Music on site! Join us for an reception celebrating the opening of our latest exhibitions! Featuring the Pittsburgh Print Group’s show "Under the Blankets – Printmakers Together", Paul Mullins and Imin Yeh’s "Here is Something That You Might Like to Have," and "Family Meeting," a show of recent work by current advanced Print Media students from Carnegie Mellon University’s School of Art, these exhibitions will be on view from May 4 - July 8, 2018. A lecture and guided gallery talk by Imin Yeh, Exhibition Project Advisor, will be presented during the opening, at 7pm on Friday, May 4. Exhibiting artists as well as the public will have an opportunity to view the exhibit and to interact with some of the finest printmakers in the region. FREE and open to the public! Light refreshments served. Under the Blankets – Printmakers Together is made possible through funding from the Pennsylvania Council on the Arts, the Fine Foundation, the Buncher Foundation, and Dollar Bank. Join AAP as we celebrate the opening of By Means of Play, an exhibition curated by Emma Vescio featuring the work of AAP members Andrew Allison, Pati Beachley, Jamie Earnest, Joshua Kosker, Crystal Latimer, Deanna Mance, Paul Peng, and Gray Swartzel. Let's pour some paint together! Take time to appreciate the natural flow of paint. Learn how to use a paint pour to create a finished piece, or lay an exciting foundation for something new. Explore different grounds, tools, acrylic mediums, and techniques that will help you create a perfect swirl of color on your canvas. Supply list provided. Classes begin Feb. 8th. Click HERE to reserve your seat today! Want to create something together?! I'll be hosting a new two-session workshop at the Pittsburgh Center of the Arts on Nov. 29th + Dec. 6th called PAINTING WITH TEXTURE. Get that last-minute gift started or enjoy a little personal time before the madness of the holidays in this quick and fun workshop. Experiment with creating texture in your paintings using unique mediums including cold wax medium, gesso, string gel, ceramic stucco gel, and modeling paste on a variety of painting surfaces. Sign up HERE to reserve your seat! 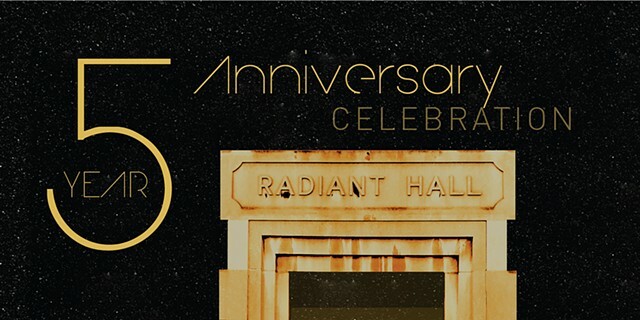 Radiant Hall is turning 5! >>My studio, Radiant Hall, is turning 5 and celebrating in a big way! Radiant Hall is having an exhibit to celebrate their artists both past and present! The show will be on display at Framehouse & Jask Gallery in Lawrenceville from Oct. 21st-Oct. 30th. Want to party even harder?! Well, we'll also be having a Preview and Dance Party at F&J on October 20th. Purchase tickets to this exclusive event through Radiant Hall's website HERE. Join me on Friday, October 6th from 6-8pm for the opening reception of my newest solo show at Penn State, New Kensington campus. I'll be debuting new ..and somehow even more colorful.. paintings, alongside some older favorites. The title of the show todavía, translating in English to "still", alludes to the overarching history of Westernization in Latin America, and how my 2015-2017 pieces work as a collective under these same conceptual concerns. Three Rivers Arts Festival was a SUCCESS! A big THANK YOU to all that came out and visited my booth in Gateway Plaza! My walls were bare by the end of 5 days, so much gratitude! Ah! Excited to have been curated into another group show filled with such talented artists. Be sure to stop by the opening reception so you can have a drink and chat with the all the creatives. I recently did a Studio Visit Interview with Leila Leiman of AMM. It was beautifully conducted and thorough, so if you have a minute check it out HERE! Looking forward to showing with these artists, in an exhibition curated by Sean Beauford! Check it out at Framehouse & Jask Gallery this month! Have you guys checked out Art Maze Magazine yet?! Based out of London, this publication has a keen eye for new talent and bold work! I was *thrilled* when I heard my own was work curated into their April/May Issue! You can buy a print version, or download a digital copy for only $5! (don't you just love technology). Click HERE to go to their shop, or HERE to check out their Website! I'll be teaching another 8-week Contemporary Painting Practices course at the Pittsburgh Center for the Arts in April & May. 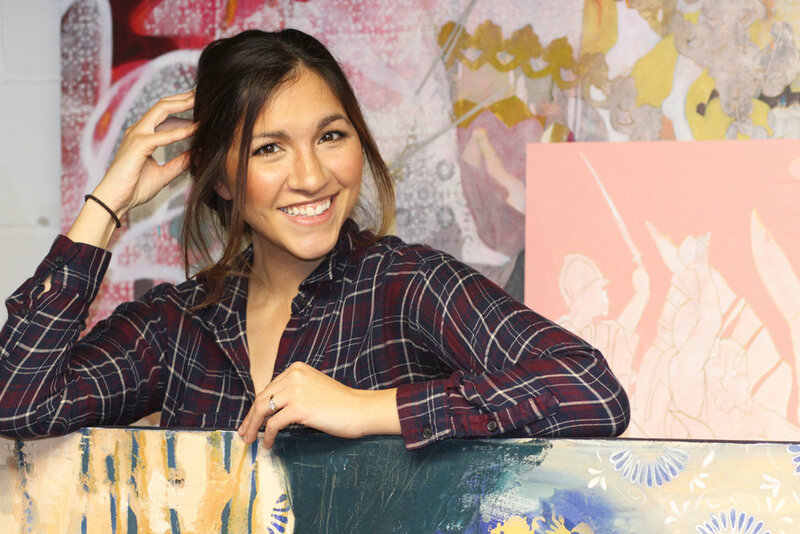 Class Description: Expand your practice of traditional painting methods to include materials like spray paint, metallic gilding, and diverse painting supports to experiment with surface and solvency. Incorporate various mark-making processes like printmaking and collage to build layers and create richness within your artwork. 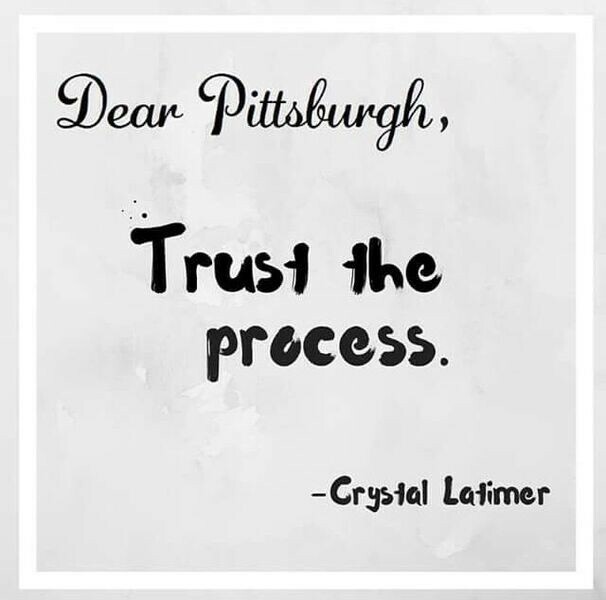 Become inspired by contemporary artists who work in multimedia and work with Crystal Latimer who will share insight into her artistic process. 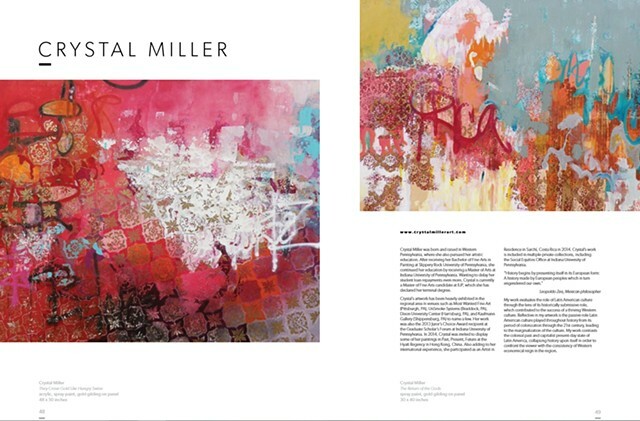 Somehow my paintings have ended up in the same brochure as the artistic geniuses of Andy Warhol and Alexander Calder! Whaaaat?! CRAZY. So, of course, I had to share. Check out Pittsburgh International Airport's "Art in the Airport" Brochure HERE . Extra, Extra! I'm in the newspaper! *Thank you* to Kevin Lorenzi who wrote this lovely article that got published in my hometown papers of Ellwood City Ledger and the Beaver County Times. Access the write-up HERE . It was a packed gallery!